In Balanced Achievement’s The Weekly 5 series, we aim to present you with five ideas, products or tools that you can utilize to enhance the quality of your life. In this week’s article, we look at five enlightening TED Talks on mindfulness and meditation that are sure to enrich and enliven your practice. It was in 2006 when the now globally beloved non-profit organization known as TED launched an inspirational video lecture series that would instantaneously change the way ideas spread. In fact, after the organization posted the original six TED Talks on their website, given by the likes of Al Gore, Tony Robbins and Majora Carter, people around the globe became so absorbed in the thought-provoking discourses that the undertaking amassed one million views in just two months and many millions more in the following years. Thanks to the organization’s ongoing commitment to making ‘ideas worth spreading’ accessible to as many people as possible, an ever-growing collection of fascinating addresses, which collectively have been watched billions of times, is now freely available online. In addition to the nearly 3000 Talks housed at TED.com, the organization’s community scaled venture known as TEDx has added over 100,000 speeches to TED’s momentous digital library and it’s from this vast selection of contemplative lectures that we’ve selected the most enlightening TED Talks on mindfulness and meditation. Due to the fact that there are hundreds of TED Talks that in someway relate to the practices of meditation and mindfulness, we decided to chose five timeless lectures from the 2,700+ videos featured at TED.com. Yet, because fully illuminating only five iconic TED speeches on meditative practices would assuredly leave much to be desired, we’ve subsequently included a list of 20 additionally enlightening TED Talks on mindfulness and meditation, along with brief descriptions for each, below. When it comes to discussing the ways in which we can create and sustain a lasting sense of blissful contentment by undertaking a meditation practice, there may not be a more qualified individual than the man who’s been described as the world’s happiest. That is, of course, the beloved French molecular biologist turned Tibetan Buddhist monk Matthieu Ricard. In this fun and insightful Ted Talk, filmed at TEDSalon London 2012, former Buddhist monk and Headspace co-founder Andy Puddicombe sheds light on the unwholesome effects of living unmindfully and tells us how we can refresh our minds by practicing meditation for as little as 10 minutes each day. 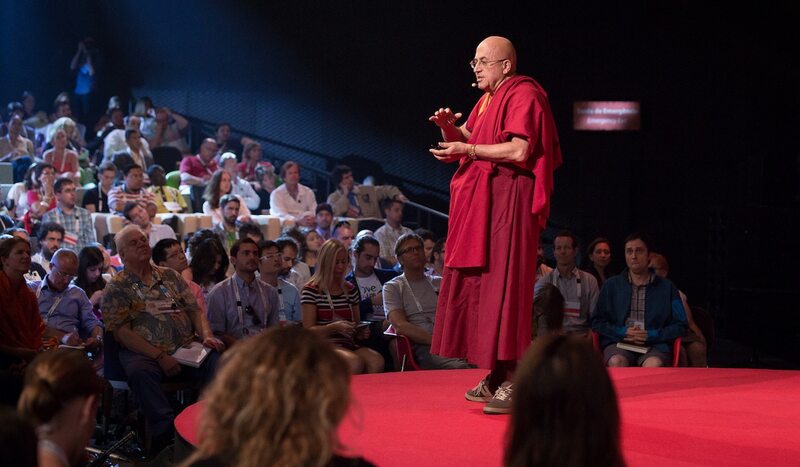 Throughout the speech, which has been viewed nearly nine million times, Puddicombe, who gave up his university studies to become a monk in the Himalayas when he was 22 before later renouncing his monastic duties, bolsters his message by recalling his own life story, discussing the ways mindfulness can help us handle the inevitable stresses of life and outlining a practice framework that even the busiest of people can carry out. “Meditation offers the opportunity, the potential to step back and to get a different perspective, to see that things aren’t always as they appear. We can’t change every little thing that happens to us in life, but we can change the way that we experience it. That’s the potential of meditation, of mindfulness,” he tells us. It was in October of 2009 when Charter for Compassion, a non-profit organization founded by bestselling author and 2008 TED Prize winner Karen Armstrong, hosted a five day summit, at the Chautauqua Institution, where three prominent religious figures took to the stage to deliver a memorable collection of TED Talks focused on the topic of compassion. In addition to the beloved Christian Minister James Alexander Forbes Jr. and the celebrated Hindu Swami Dayananda Saraswati, the highly distinguished Buddhist scholar and author Robert Thurman offered his kindhearted insights in a speech titled Expanding Your Circle of Compassion. Over the past two decades, American psychiatrist Judson Brewer has become an internationally acclaimed mindfulness addiction expert who’s integrated findings from his esteemed research, examining the practice’s ability to induce habit change, into powerful programs and Apps aimed at helping individuals struggling with smoking dependence, emotional eating and anxiety disorders. In his 2015 Ted Talks A Simple Way to Break a Bad Habit, which has been viewed over nine million times, Brewer not only shed light on his groundbreaking work but also on the science of habit development and the transformational power of mindful curiosity. Even if you aren’t struggling with one of the addictive behaviors listed above, it’s certain that Brewer’s enlightening speech can help you change any undesirable habit. “This is what mindfulness is all about: Seeing really clearly what we get when we get caught up in our behaviors, becoming disenchanted on a visceral level and from this disenchanted stance, naturally letting go,” he tells us. One year after releasing a landmark research paper that laid out finding from a psychological study focused on answering the question ‘When are humans most happy?,’ psychologist Matt Killingsworth stepped on stage at TedxCambridge 2011 to deliver a powerful speech titled Want to Be Happier? Stay in the Moment. During the talk, Killingsworth discusses his revolutionary project that collected 250,000 well-being data points from 2,250 participants with the help of a smartphone App called Track Your Happiness. 1.) Majesty of the Present | Clifford Saron: Throughout this thought-provoking speech delivered by prominent neuroscientist Clifford Saron at TEDxUCDavis 2012, you’ll have the chance to learn about a landmark scientific research venture, which aims to investigate the psychological and physiological affects of meditation, known as The Shamatha Project. 2.) Consciousness – The Final Frontier | Dada Gunamuktananda: Unlike the vast majority of Hindu holy men who don saffron colored robes, the yogic monk and meditation teacher Dada Gunamuktananda hails from New Zealand and speaks with a seemingly misplaced accent. This, however, isn’t to say that his message holds any less weight in comparison to his Indian peers, and in this incomparable Ted Talk, you’ll discover the transcending power meditation can have on one’s consciousness. 3.) Vipassana Meditation and Body Sensation | Eilona Ariel: It was in 1997 when two Israeli filmmakers released the acclaimed documentary Doing Time, Doing Vipassana which examines the transformational power of an ancient meditation technique believed to have been taught by the Buddha himself. Nearly 15 years after the film was released, at TEDxJaffa 2013, director and producer Eilona Ariel took to the stage to deliver this thought-provoking lecture about the role body sensations play in Vipassana Meditation. 4.) The Power of Mindfulness: What You Practice Grows Stronger | Shauna Shapiro: It was at the star-studded TEDxWashingtonSquare event in 2016, which spotlighted the theme of personal change, when accomplished psychologist and mindfulness expert Shauna Shapiro took to the stage to illuminate how meditative practices can change our brains and lives. 5.) The Technology of the Heart | His Holiness the Karmapa: In the tradition of Tibetan Buddhism, there are few monastics held in higher regard than the Karmapa Lama and in this enlightening Ted Talk you’ll meet the man considered to be the 17th reincarnation of the distinguished figure. Throughout the speech, which is translated onstage by Tyler Dewar, His Holiness not only recalls his life story but also tells us why it’s so important to dedicate ourselves to designing and developing the technology of our hearts. 6.) The Art of Stillness | Pico Iyer: With over two and a half million views, it’s certain that this 2014 Ted Talk delivered by globally renowned travel writer Pico Iyer, who illuminates the transformational power that comes from spending time alone, can encourage us to master the art of stillness. 7.) The Mindful Way Through Depression | Zindel Segal: In this fascinating 2014 TEDxUTSC Talk, Zindel Segal, co-founder of Mindfulness-Based Cognitive Therapy (MBCT), explains how mindfulness can help individuals dissociate themselves from feelings of gloom and overcome the incapacitating mental health disorder of depression. 8.) Mindfulness and Neural Integration | Daniel Siegel: It was at TEDxStudioCityED 2012 when acclaimed author and distinguished educator Daniel J. Siegel steps on stage to deliver this thought-provoking speech which examines how relationships and reflection rooted in mindfulness can help our children develop resilience. 9.) Transform Your Mind, Change the World | Sharon Salzberg: From the beloved American Buddhist teacher Sharon Salzberg comes this inspirational Ted Talk on the transformative power of meditation. During the speech, which was given at TEDxBinghamtonUniversity 2012, Salzberg offers insights on a variety of meditation topics including happiness, compassion and the science behind the practice. 10.) Why We All Need to Practice Emotional First Aid | Guy Winch: While this powerful 2014 Ted Talk, which has been viewed over five million times, delivered by psychologist and author Guy Winch doesn’t directly touch upon meditative practices, his psychological insights about the brain, and how we neglect ourselves emotionally, indirectly show why mindfulness and meditation can have such a positive impact on our lives. 11.) The Profound Journey of Compassion | Dayananda Saraswati: It was at the same 2009 Charter for Compassion summit that Robert Thurman delivered his speech Expanding Your Circle of Compassion when the beloved Hindu Swami Dayananda Saraswati gave a similarly auspicious talk. During his 17 minute address, Saraswati lays out a paralleled paths, of personal development and attaining unwavering compassion, that’ll help us attain self-realization. 12.) How Meditation can Reshape our Brains | Sara Lazar: Over the past 20 years, there have been a plethora of prominent scientific researchers who’ve vastly improved our understanding of the many health benefits individuals attain from practicing meditation. Unquestionably, one of these researchers leading the charge is Harvard Neuroscientist Sara Lazar, and in this 2011 TED Talk, she’ll show you how meditative practices can structurally change the brain. 13.) Getting Free of Self-Importance is the Key to Happiness | Polly Young-Eisendrath: While spiritual teachers from different religious lineages certainly don’t see eye to eye about every aspect of meditation practice, there’s nearly unanimous consent that seekers must remove a veil of self-centered ignorance, that naturally develops as we age, to attain the fulfillment they seek. In this 2013 Ted Talks, Buddhist psychologist Polly Young-Eisendrath explores this idea while offering advice for overcoming the inevitable emotional challenges that hamper our happiness. 14.) Breathing Happiness | Emma Seppala: From the Science Director of Stanford University’s Center for Compassion and Altruism Research and Education and author of The Happiness Track, Emma Seppala, comes this enlightening Ted Talk on the power of the meditation. Throughout her speech, which was given at TEDxSacramento 2016, Seppala illuminates the scientific reasons why our breath can be our greatest ally in life. 15.) Self-Transformation Through Mindfulness | Dr. David Vago: In this motivational Ted Talk, you’ll here from trained cognitive neuroscientist Dr. David Vago who has decades of experience practicing, teaching and researching mindfulness. During the speech, which was given at TEDxNashville 2017, Vago points out how mindfulness and meditation can transform our lives and our brains. 16.) How Mindfulness can Help You to Live in the Present | Rev. Takafumi Kawakami: Unquestionably one of the most life-affirming benefits attained by practitioners of mindfulness and meditation is a natural inclination to live more in the here and now. In this inspiring talk from TEDxKyoto 2015, Rev. Takafumi Kawakami, the Deputy Head Priest at Kyoto’s Shunkoin Temple, tells us exactly why taking up a mindfulness practice is such a wholesome thing to do. 17.) Hardwiring Happiness | Dr. Rick Hanson: In this inspirational 2013 Ted Talk, neuropsychologist and New York Times Best-Selling author Rick Hanson tells us how we can mindfully overcome our brain’s negativity bias by shedding light on the mind transforming power of everyday experiences. 18.) Reaching Your Fullest Potential Through Meditation | Jenn Fairbank: It was at TEDxGreatHillsWomen 2015 when the accomplished mindfulness teacher Jenn Fairbank took to the TED stage to deliver this intimate address. In addition to telling us how meditation can help us reach our fullest potential, Fairban also leads the audience through a short guided meditation practice. 19.) How to End Stress, Unhappiness and Anxiety to Live in a Beautiful State | Preethaji: Although it was only six months ago when this insightful talk from TEDxKC 2017 was published on YouTube, it’s quickly amassed nearly one and a half million views. The reason for the speech’s popularity, of course, are the enlightening words, about stress, meditation and bliss, shared by the beloved Indian spiritual teacher Preethaji. 20.) Happiness is All in Your Mind | Gen Kelsang Nyema: It was at TEDxGreenville 2014 when American Buddhist nun Gen Kelsang Nyema stepped on stage to offer a compelling lesson about the internal roots of happiness while also leading hundreds of audience members through a calm inducing guided meditation.